I wanted to knit something, but I wanted to make sure I would finish it. 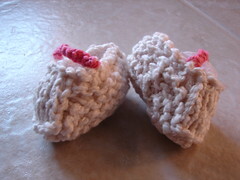 So, I thought I would knit these one hour baby booties for a baby shower gift. I had originally done them in a smaller needle size, but my gauge was so tight that they would barely fit my cat’s front paws. I upped the needle size and came out with a pair that works. The pattern is pretty simple. The first time I knit this pattern was when I was teaching someone to knit. The most complicated thing in the pattern is skp, which is pretty much like binding off. Not something to be afraid of.